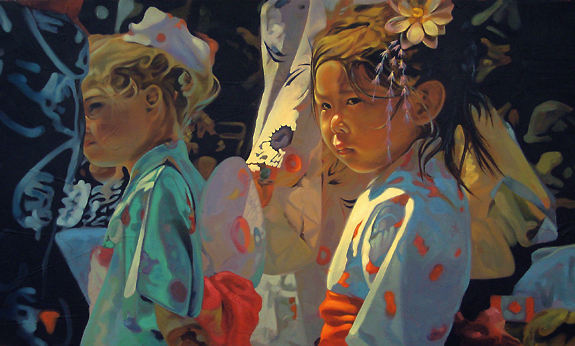 This painting has been voted best painting (best 2D) at the Sooke Fine Art Show for 2010. My youngest daughter Sarah, age 10, and I have come to visit in Steveston, B.C. with my sister Jennifer and her husband Neil. Our main objective is the Jonas Brothers concert in Vancouver. A big treat over the Canada Day weekend. Sunday after the concert is Canada Day, July 1, 2009. We walk the short distance to the main road in Steveston, where it seems like the entire population has turned out, either to watch or participate in the annual Canada Day parade. Sarah and I stake a claim on the curb and watch the procession. The range of cultures represented makes me proud to think that Canada is perhaps the only place in the world where such a culturally diverse event could take place. Steveston is a famous fishing port at the mouth of the mighty Fraser River. It’s home to the Gulf of Georgia Cannery, which canned salmon for many years and was a staple of the war effort. It’s now a popular museum. I fished commercially with my uncle off the west coast of Vancouver when I was young. He spent many years there, and later published the book Smilie, about his adventures. In it, he recounts his experiences with the different cultures that came to work the canneries. Each culture had its specific domain. The Japanese were known for their net work. They ruled the net loft, repairing nets. It was their space, and you dared not enter. Each culture lived, dined and worked separately, tolerating the other – an uneasy détente.